"This is very easy and very tasty." 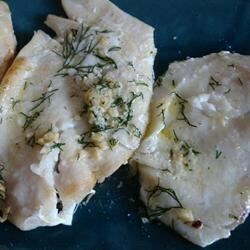 Place fish filets in a microwave-safe dish. Cut butter into pieces and place all over fish. Sprinkle with dill weed and lemon pepper. Drizzle fresh lemon juice all over the fish. Cover and cook on high for 3 to 5 minutes or until the fish turns white. I baked it at 350 for 25 minutes until it flaked, instead of microwaving it. Easy and tasty. I made this as directed, except I made it on a George Foreman grill, and instead of using butter, I used butter flavored cooking spray. Delicious! and very heart healthy!! This was so easy and delicious. I didn't have any lemon pepper but it didn't matter. Also, I used fresh cut dill. I did what one of the reviewers suggested and baked it in the oven.